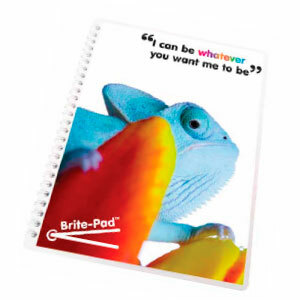 Ultra durable spiral notebook with covers using the popular brite mat mousemat material. Contains 80 sheets of 80 gsm paper. The covers are made using recycled material for an eco-friendly promotional products. Size: 190 x 240 mm. Branding dimensions: Cover 190 x 240 mm, Pages 168 x 225 mm.